Welcome to the BM Mega Marathon that will be on for the whole month of September, featuring a Buffet On Table. True to the name, we have different themes lined up for each week. Week 1 will feature Combo Dishes. I know at first shot, Combo Dishes might sound confusing, however it’s actually quite simple. When it comes to Indian Dishes, the choices are many as we seem to be eating that way. When we research further into global cuisine, we see that it’s the same everywhere too. For example, can one eat just the fries without the sauce! Chinese Wontons will taste out of the world when paired with Garlic Sauce. The list can be endless. Not just savory dishes, there are pairing done in Desserts too, like Vanilla Ice Cream with Brownie. So when we decided to have Combo Dishes, it meant we take up International dishes. Most felt it was a tough nut to crack. Though I know my friends would have cracked it out quite easily. Somehow I have always been very fond of this theme. Even though I may have already made such combo dishes already, I was eager to search for more such dishes. Given the situation at hand, I wanted simple ones. Trust me, I have landed with very simple ones. Rules of this theme is, we should pick up a pair that’s normally served together in any country and blog on it for the first week. One of the dishes can be already shared, however all the dishes should be featured in the same picture. Starting my first one of the combo dishes, I selected one from Australia, which came across as a rage from all those who traveled there. 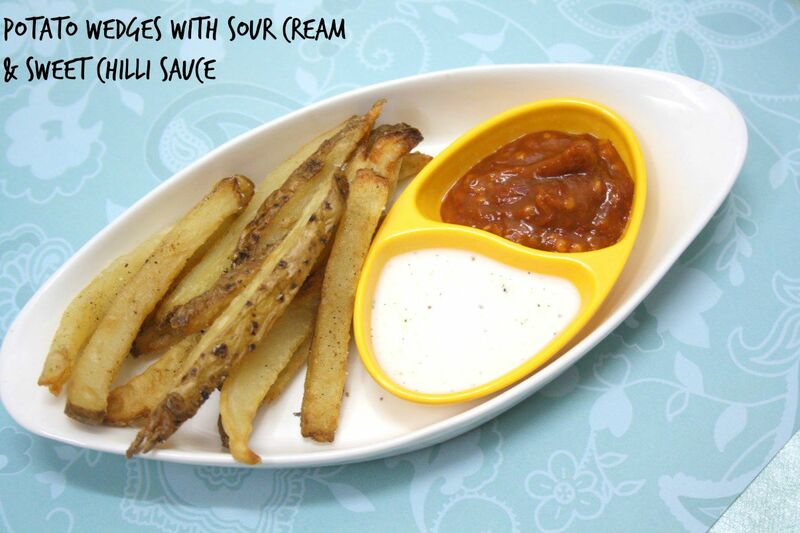 Its the famous Potato Wedges with Sour Cream and Sweet Chilli Sauce. I never expected such a humble combination to be so highly regarded by the tourists and locals as such. This combination is supposed to be Australian’s culinary secrets that the world is unaware of! And needless to say, as predicted, it was a love at first bite to us at home too. 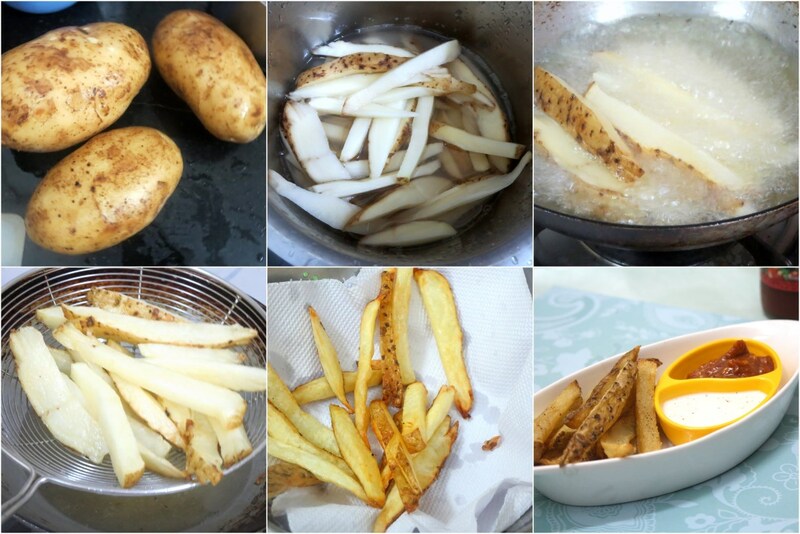 I was surprised that for all the recipes that I have done so far, I am yet to share a simple Potato Wedge recipe. Well there is French Fries and the Fry Sauce that seem to be the American way of serving a sauce with french Fries, but not a Potato Wedges. I got something interesting to share now. Unlike the French Fries or the Potato Chips, Potato Wedges have to be sliced thick. It should be crisp on the outside and soft inside. Once it cools down, it might even be soggy. So soak the potatoes in water for 30 mins and rub off mud from the potatoes. Slice them into 1 inch slices. Soak in water until ready to fry. Pat dry the wedges when the oil is heated. Deep fry in batches. 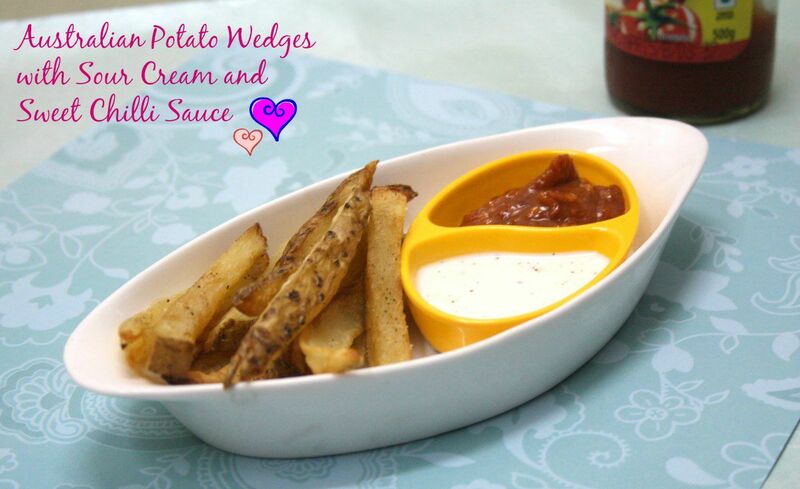 When the wedges turn slightly colored, remove with a slotted spatula and let it cool for few minutes. Deep fry again and now transfer to a kitchen towel. Valli, you sure started the Mega BM on a high note. Those potato wedges look absolutely addicive and tempting. Dipping sauces sound amazing too. Looking forward to your amazing buffet on table. These must have been a het at home. I guess every country has some version of potato fries. Wow this combos sounds delicious. Valli must try this my girls will surely go crazy. Who can say No to potato wedges esp. when it is being served with such delicious sides!!! The spicy sauce sounds yumm. I am sure the combo will be out of the world! The wedges along with those dippings look so yum. That is a great start to the mega BM. Anything with potatoes I am in.. yummy and those dipping are awesome. this is a survival combo…and great thing to kick start any event..loved the way you have presented…. That looks like a delectable combo valli. Thank god, I mailed u before doing my combo's or else I would be cracking.my head hard on this!! We always stick with readymade potato wedges but i love that u made them at home, such a beautiful crispy combo, both dips looks stunning. Super way to kick start the BM. I am sure that the fiery sauce is balanced by the sour cream. wow delicious potato wedges with a amazing cheese dip 🙂 looks so yummy ! !